Think about why you live. It’s one of the most fundamental, essential questions, but one we often forget to ask. Let’s ask ourselves, “what do I live for?” “why do I live?” Is there something that we would be willing to die for? Then that is the reason for our existence. Scripture is taken from John Chapter Twelve verses 20 to 33. Now, among those who went up to worship at the festival were some Greeks. They came to Phillip who was from Galilee and said to him, “sir, we wish to see Jesus”. Phillip then told Andrew, and Andrew and Philip in turn told Jesus., she’s a sense of the answer. Jesus replied, “The hour has come for the Son of Man to be glorified. Very truly I tell you, unless a kernel of wheat falls to the ground and dies, it remains only a single seed. But if it dies, it produces many seeds. Anyone who loves their life will lose it, while anyone who hates their life in this world will keep it for eternal life. Whoever serves me must follow me; and where I am, my servant also will be. My Father will honor the one who serves me. “Now my soul is troubled, and what shall I say? ‘Father, save me from this hour’? Father, glorify your name!” Then a voice came from heaven, “I have glorified it, and will glorify it again.” The crowd that was there and heard it said it had thundered; others said an angel had spoken to him. Jesus said, “This voice was for your benefit, not mine. Now is the time for judgment on this world; now the prince of this world will be driven out. And I, when I am lifted up from the earth, will draw all people to myself.” He said this to show the kind of death he was going to die. John. 12, 24 is one of my favorite scripture passages. Very truly, I tell you, unless the grain of wheat falls into the earth and dies, it remains just a single grain, but if it dies, it bears much fruit, meditate on it. It is a core of what we believe. It is one of the very, very famous passages of Jesus. I think one of the most insightful passages we need to remember, and then keep it in our heart. So if you can memorize, the scripture passage, I think that will be very much helpful, you don’t have to memorize them word by word, but if a seed we made this as a single seed, then it doesn’t bear fruit, but if it falls on the ground and dies, it bears fruit. So natural. It is truth about the nature. At the same time, Jesus saying that, that natural truth, it’s also the truth of life. That’s what life is all about. If your life just remain as your own individual seed, then it would just remain as a seed, but when you live your life, giving away your life and not only your blessed, but that seed will not remain as a seed, but it will bear fruit that benefits not only you, but also others. Well, what a wonderful truth that Jesus taught us. That is what life is supposed to be; full, fruitful life. Life that’s not fruitful, It’s a meaningless existence. If that fruit tree does not bear fruit, what good is a fruit tree? Fruit trees bear fruit, and you’re supposed to bear the fruit. So we do believe that that is true. We do believe that is how we should live our lives. What is a Fruitful Life? We should bear fruits, you know, and then we believe that it is very important for our existence. I like to reflect with you together; What is fruitful life? How can we, how do we, how can we define a fruitful life? When can you say that you are living a fruitful life? That is something that I’m going to explore with him together, but I don’t want to give you common sense. I don’t want to give my individual opinion. I think the most important guidance for our life is in the scripture and the teachings of Jesus Christ. 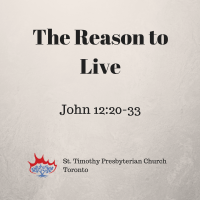 What does Jesus tell us about fruitful life that’s from today’s passage? That’s what I’m going to reflect with you today. Then first thing that I want to kind of clarify is that being fruitful and successful are two different things. Fruitful life and successful life are two different things. The reason I’m saying that is because a lot of people, as soon as they hear about fruitful life, they’re thinking about a successful life, and a lot of people are confused with these two concepts, but I do believe that fruitful life and successful life are two different things. Being successful is what looks on the surface. It can be measured in number, it is quantifiable, if you have $10,000,000 in your bank account you are successful very much, and if you have several degrees of phds in different in fields, then you are successful. If you win a Nobel prize then you’re successful, and if your child plays in NHL, then you can say that you are successful. I mean, these are great things, but being fruitful is different. Being fruitful is different for everybody. We cannot compare one person’s fruitfulness with another person’s fruitfulness. It’s like comparing apples and oranges. Being fruitful it’s different for each person, it’s not something that everybody admires. You’re fruitful in your own way. I’m going to explain to you, you don’t need to have $10,000,000 in your bank account to be fruitful. You don’t need to have several degrees to be fruitful. You don’t need to win the Nobel prize to live a fruitful life and you. You don’t need to have a child, who plays in the NHL to say that you’re living a fruitful life, so I hope that I have a fruitful life too. Fruitfulness cannot be measured in number. Being fruitful is to do with your existence. Being fruitful to me, it’s to have a sense of existence. Fuller sense of existence. What does that mean? Fuller sense of existence? How does one live a fuller sense of existence? Having a fuller sense of existence has a character. I think from the scripture that Jesus told us, having a fuller sense of existence is to have a clear purpose in mind. To have a fuller sense of existence means to have a clear sense of purpose of their life. Ask yourself, why are you doing what you’re doing? Why are you doing what you’re doing? Do you have clear sense of purpose for what you’re doing? What do you want to do with your life? What do you want to do. in KSM Service, in the morning a young man actually came to our service. A young man came for his first time, he came from St. John’s Newfoundland, he finished law school there and he came to our service and then he came actually to do a bar exam, so a few days later, he told me after the service that he came to me, you really gave me, you know, thought to really think about why am I doing, what I am doing? I am really thinking about why did I come all the way to Toronto to go to do the bar exam? And then what do I want to do? Why are you doing what you’re doing? Do you have a clear answer to that? If you do, you have fuller sense of the existence. If you don’t know why you’re doing what you’re doing, then we need to think about, what are we doing with our life? It has to do with how comfortable your life is right now, to know how comfortable you are with being comfortable with God. you look into the scripture passage, the second part of scripture passage shows Jesus’ agony. In the first part jesus talks about life that bears fruit, but in the second part jesus talks about agony. Let’s look at this. The first part is very true I tell you, there’s a grain of wheat falls into the Earth we made, it’s just a single grain, but if it dies, it bears fruit. It’s about fruitful life. It is important to have fruitful life. In the second part jesus says “now my soul is troubled and what should I say? Father save me from this hour. Now, it is for this reason that I’ve come this hour. I was thinking about how difficult it must have been for Jesus to say prayer like that. Save me from this hour, just because he doesn’t have job. Just because he doesn’t have money, or he’s hungry. I don’t think he would say things like that, but it must have. He must have gone through tremendous pain and agony to even pray that; save me from the sorrow, the son of God. It must have been very, very difficult for him, I don’t think that I realized is that Jesus is exactly same as us. Jesus felt exactly the same thing as we felt. When he is in certain situation, he felt exactly the same as any other human being would have felt. He felt the pain. He felt the fear. Jesus Christ, son of God as is not immune to everything that we felt, every single thing that we felt. His life at that moment was far from being comfortable. That’s why verse 27, he said, “my soul is troubled and save me father from this hour.” No, it is for this reason, and I had to come to this. This passage is this true? More important than diamond. hear it, memorize because it describes the inner world of Jesus Christ. Not just what Jesus did on the surface, but what Jesus went through, in his heart, in his soul. What do you find? You find that his soul was trouble? Why was he troubled? Because of his understanding of the coming of his own death. In verse 23, he said, “The hour has come for the son of man to be glorified.”. To be glorified does not mean that now I’m going to have a good life. What does that mean? Time to be glorified as in time to die. Jesus saying theoretically it is time to die. My time has come to a time to die. That’s why his soul was troubled and in that trouble. So he said, save me from this hour, which is a natural reaction for any human being. What would you pray that prayer? No. Tonight we have a funeral, a few days ago I visited an elder Kevin’s father, grandfather. And he knew that his time had come, when I recited the scripture was nodding and he was in tears. He knew his final hour was coming very close, and I didn’t know that this would come this fast. And after a few days, I got a call at 12:30 or 33 in the morning. So I visited the hospital, by that time he passed away. Last hour of a person, Jesus went through that, father save me from this hour. Last week, my cousin came from China, he has a missionary in China. About three years ago he had a heart attack in Asia. He is younger, three years younger than me and he had a heart attack in Asia, Southeast Asia. There was no hospital but somehow, they found a clinic and he was hospitalized and he survived. So he got a bypass surgery a few days later, so he had a heart problem. And so I asked him, “so how are you doing? How’s your heart, how’s your health? He said “Hyung, I don’t know”. I said “you don’t want to go to a hospital?”. He said “you know, you know, when I go to the hospital they told me not to go where I have to go because the place I go to, there’s no clinic, there’s nothing in it. They are prohibited from going there. So I have to choose, do I go there or do I listen to a doctor? So I chose to go there to so I don’t listen to the doctor”. He had a clear reason to die for, and I believe he has a clear reason to the reason to live. If you have reason to live, then your existence is fruitful existence. It is fruitful existence, that was what Jesus meant when he said, “unless a grain of wheat falls into the earth and dies, it remains just a simple grain, but if it dies, it bears much fruit.”. After that jesus said this, “those who love their life, and those who hate their life in this world will keep it for eternal life.” In the word hate is not emotional discussed feeling. You know there’s a Jewish expression, I love this more than that. And you say, I love this and I hate that. That’s what it means, it means simply letting go. Let me rephrase it in this way, for you to understand better. Those who love comfort of life, will lose the true essence of life, and those who give up their comfort of the reason to live, they will find eternal life. I realized that the greatest temptations of North American people are facing is to be secure. Safety and security, In the meanwhile, we lost the reason to live. We’re so busy securing our own future and safety, in the meantime we lost the reason to live. I think that is a greatest temptation We North Americans are going through. Fruitful life is not merely existing, fruitful life is to live with a clear reason to live. God gave everyone a different reason. So we cannot compare. We can tell other people how, how they should live, but everybody’s different, but everybody needs to have clear reason to live. We cannot compare it. We have our own cross to carry. Olivia, you are conducting this choir, that’s your reason to live. I have reason to preach the gospel, that’s my reason to live. We have different purposes, but we give our whole life for it. In that sense, we are the same. Everybody has different reasons to live, that reason doesn’t have to be so gigantic, so admirable that everyone admires it, we don’t need to be that. You don’t need to have that. It is simply to do with why? The reason to live is simply to do with who I am, so if we don’t find a reason to live, that means we lose the integrity of who we are. Then we’ll live the way others want us to live. I don’t want to live the way others want me to live. I’m looking to find my own reason to live. No matter how insignificant that may be, no matter how small that may be, that is life, that is authentic existence. I don’t want to follow other people’s footsteps. I want my own path. That’s my journey and that’s your journey, why do you live? Why do you live? To make money? To be famous? To raise your children? To have comfort of life? Why do you live? We have to find it, once we find it, then life will be gushing forth from the bottom of my heart, and that life will bless us, and that life overflows and blesses others, that is what fruitful life is all about.